It’s been a few years now since I discovered the work of Pauline Johnson and I’ve been enchanted by her writing ever-since. Pauline Johnson (1861-1913) was the child of a Mohawk chief and an Englishwoman and as a writer and poet, she traveled across North America and England giving readings of her work and performing on stage. She retired to Vancouver and continued to write for the Province basing her articles on stories shared by her friend Chief Joe Capilano of the Squamish people of North Vancouver. In 1911, to support Johnson who was terminally ill and not wealthy by any means, a group of friends organized the publication of her stories under the title Legends of Vancouver [source: wiki]. Pauline included “a 100-word foreword telling of her debt to Chief Joe Capilano, his role in the Legends, and mentioning that most of them were being told in English for the first time.” [VancouverHistory] In 1913 she died of breast cancer at the old Bute Street Hospital in Vancouver. I would highly recommend looking up some of the stories and poetry she wrote and documented based on local lore. You’ll find things like The Two Sisters (the story of the lions), Siwash Rock, The Isle of the Dead Men (Deadman’s Island in Stanley Park), The Lost Island, The Great Grey Archway, Deer Lake’s Lost River, and one the personally chills me, The Lure in Stanley Park. Legends of Vancouver is available at local book stores (call ahead to any Book Warehouse location to check), the library, and you can also find a few of the stories online. Her tales of a Vancouver not many know or perhaps have heard nowadays combined with her international career not only make her a pioneer in this city, but in so many other realms. She was even commemorated on a postage stamp in 1961 — being the first aboriginal-Canadian, first woman (other than the Queen), and author to ever be honored in this manner. Johnson was also credited with giving Lost Lagoon its name since before it became land-locked in 1916 it disappeared at low tide. 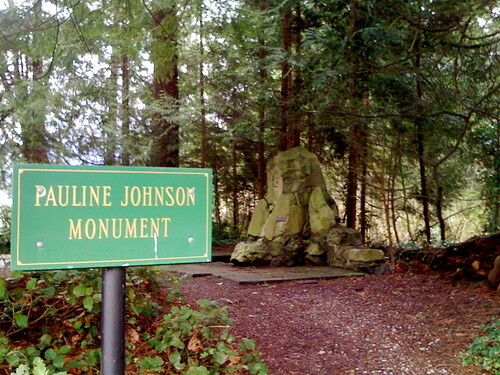 The Pauline Johnson memorial in Stanley Park, which was built in 1922, is just off the road between The Teahouse and Third Beach. It’s overgrown and the fountain no longer flows but next time you’re in the park, stop on by to tribute this legend. Bravo! 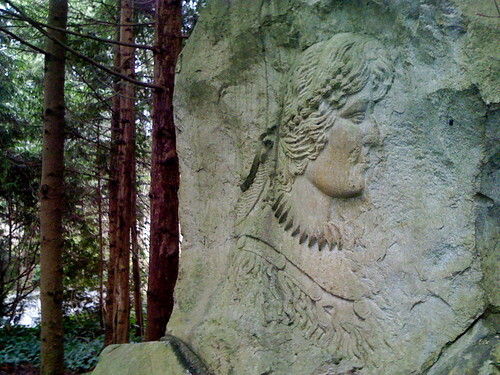 and thanks for this great post … and your Vancouver history pieces in general, Rebecca. Legends of Vancouver,/i> is one of my most treasured books and I have somehow lost my copy of Flint and Feather which contains her famous poem, “The Song My Paddle Sings.” I had Pauline Johnson drilled into me, so to speak, as I attended Pauline Johnson Elementary School in West Vancouver for seven years, which is now a French immersion school (which my two children attended) called Ã‰cole Pauline Johnson. Your readers may also appreciate knowing that Legends of Vancouver is available online at Project Gutenberg, as is Flint and Feather. There are several other works by Pauline Johnson at Project Gutenberg, too. 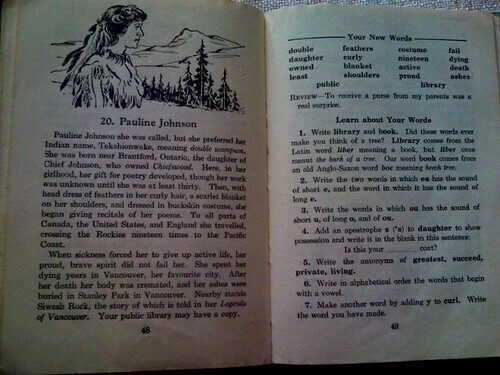 I studied Pauline Johnson’s literature as part of a compulsory British Columbian Lit. class at SFU. It was great to finally learn about my own province and our history in Vancouver. Great post! Greetings and thanks from a second Pauline Johnson School alumna. Enjoyed this post, Rebecca. Love the history posts! Just moved to Vancouver and this is great stuff to learn about my new home. I have a first edition bound in leather of PAULINE JOHNSONS book dated (I think) 1905 but it doesnt mention the story of the Sleeping LADY on the north shore mtns. Does anyone know how that originated?